It’s been almost two years since Gradius, the best side-scrolling space shooter on the NES, has released. Since then there have been dozens of copycats trying to steal its thunder, but none have succeeded – until now. It seems like only Konami could outdo itself, and boy has it ever with the pseudo-sequel to Gradius called Life Force. It mixes everything we loved from the first game and supercharges it with two-player co-op to create one of the most enjoyable and action-packed games since Contra (another Konami masterpiece) arrived back in February. You won’t want to miss this one! We really haven’t discussed this in any of other reviews, but I must give Konami credit for taking such care in the design of its NES boxes. Over the past few years they have consistently delivered stunning artwork with every single new release. From their iconic gray borders to the wonderfully written prose on the back, the company really knows how to make their games stand out from the pack. With consistent quality games, players only have to look for the beautiful boxes to know they’re probably picking a winner. Now, on to Life Force! If you’ve played Gradius, you’ll immediately be familiar with the gameplay mechanics of Life Force. You fly a spaceship on an automatically scrolling level and shoot down the enemies flying in every direction. As you successfully pick off bunches of them, some will drop a power-up that can be picked up to increase your ship’s abilities. You can choose to use it right away on a lower-end power or keep stacking them until the power gauge reaches another power-up that’s more to your liking. You’ll have a variety at your disposal and these can range from things like Missiles, Ripple Laser, Speed Up, and the very helpful Force Field. However, just like in Gradius, my favorite power-up is something called an Option. When you select this one a glowing orb will follow your ship and clone your shots. Basically it’s like having a wingman fly the same pattern and fire the same shots as you, making you even more lethal than before. You can have up to two options at the same time, meaning you can have triple the firepower! If you and your co-op buddy can manage to each max out the Option power-up it’s like having six ships firing at once! At first Life Force looks like a run-of-the-mill sequel with side-scrolling scenery flying by as you shoot down baddies. However, by stage two it’s obvious that the developers went above and beyond and included overhead vertical-scrolling stages as well! The game consists of six stages with alternating views, keeping the action exciting. This time you’re not just flying through space, but you actually shoot your way through grotesque living organisms. You’ll have to blast apart pulsating organs and tissue, which borders on gross, but ultimately adds to the unique experience. In fact, the first boss you come up against is a giant brain with a huge Cyclops eye that you must target to blow it to smithereens. You won’t easily conquer the game until you memorize the enemies’ patterns and master the game’s controls. However, if you’re really stuck there just might be a way to bolster your odds via a certain Konami code (hint, hint). Graphically Life Force looks even better than its predecessor. The scenery is more detailed and very often there are interactive animated sections of the level that must be avoided or destroyed. The changeup in viewpoint for every other stage is a welcome change of pace and must have been a chore for the graphics team to come up with new sprites for each type of scenario. Given that the game is often littered with enemies and the fact that you can now play two players simultaneously means the game suffers from occasional slowdown and flicker. This is a common occurrence with NES games of this nature and it didn’t faze us at all. As we’d expect from the company, the soundtrack is fantastic throughout. The various stages feature unique music and you’ll be hearing the tracks over and over again as you crash and burn. This led to various songs being seared into my brain and I’d often find myself whistling some of the music a few days later. The sound effects are effective and satisfying, although I swear a few of them are ripped right out of Contra. It’s a bit strange that each stage begins with no sound effects, but eventually they filter them back in. We’re not sure if this is a design choice or some type of memory allocation problem. It’s not a big deal, but noticeable enough to comment on it. When we add everything together, Life Force stands tall as the best space shoot’em up available for the NES. It has it all: beautiful graphics, amazing music, responsive controls, challenging levels, and best of all it can be played with a friend! Like most games of this ilk the game presents a rather high difficulty at first. However, if you stick with it and keep practicing you will reach the end without the need for any cheat codes. This is the perfect game for the NES Advantage as it’s easier to fly at angles with the joystick and the turbo buttons come in handy! The selfish part of me wishes there were maybe double the stages, but that’s just because I had so much fun playing each one and never wanted the game to end. Konami has once again shown they’re the masters of the NES and Life Force shouldn’t be missed! 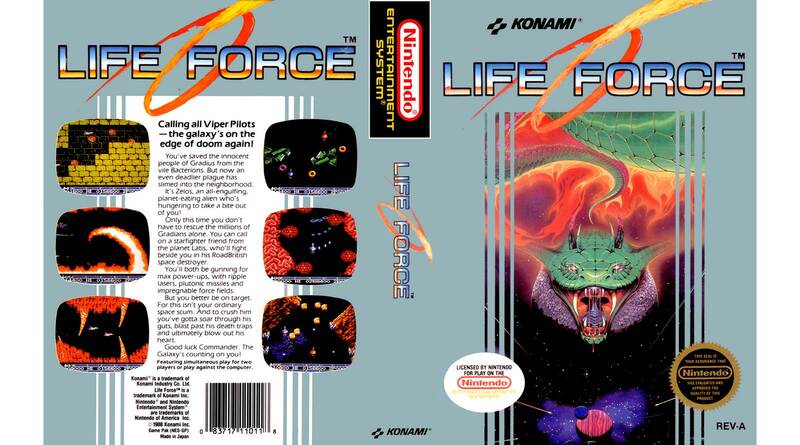 Life Force is the essential space shoot’em-up for the NES and one that shouldn’t be missed. It combines fun gameplay mechanics with detailed levels and kicking music to create a fantastic and memorable experience that can be shared with a friend via the game’s two-player simultaneous co-op mode. Get your thumbs ready for a workout! Batman, Fester’s Quest, and Terminator coming from Sunsoft. Reviews: Kung-Fu Heroes, Operation Wolf, Tecmo Bowl, John Elway’s Quarterback, Gyruss, Q*bert, Paperboy, and Track & Field II.